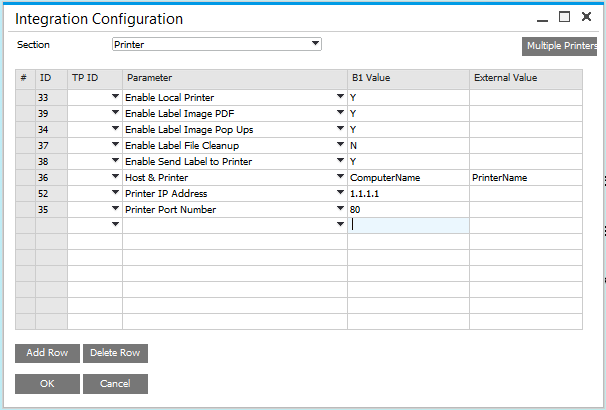 This configuration option is used for mapping the IP Address and Port for the shipping label printer in SPS Cloud EDI. Configure IP and Port for the shipping label printer. POPUP_IMAGE: Whether an image is displayed when using the printer feature. When enabled (Yes), this can be used to preview the printer label before it is printed. It may also be useful in a test environment. When disabled (No) no image preview is displayed before printing. PRINTER_IP: Defines the IP Address of the shipment label printer. PRINTER_PORT: Defines the port number of the shipment label printer. SEND_TO_PRINTER: Defines whether or not the printer feature is active (Yes) or inactive (No). POPUP_IMAGE "Yes" (image preview enabled), or "No" (image preview disabled). PRINTER_IP should only be set to a valid IP address. PRINTER_PORT should only be set to a valid port number (An integer, typically above 1024). SEND_TO_PRINTER "Yes" (printing enabled), or "No" (printing disabled).